Dorner’s 3200 Series Modular and Flat Belt conveyors, the 2200 Series Precision Move and the SmartFlex conveyor platforms have received the Ultraclean Products Approval Laboratory certification for use in ISO Standard 14644-1 Class 5, and Federal Standard 209 Class 100 rated cleanrooms. This means the four Dorner conveyors will not contribute to the contamination of cleanrooms conforming to those standards. Cleanrooms and other controlled environments provide management of airborne particulate contamination to appropriate levels for accomplishing contamination-sensitive activities. Industries that regularly use cleanrooms in their manufacturing processes include aerospace, pharmaceuticals, medical and healthcare. These four conveyors are ideally suited to operate in cleanroom environments requiring robust material handling, as well as flexibility, automation, and accurate part movement over distance and time. 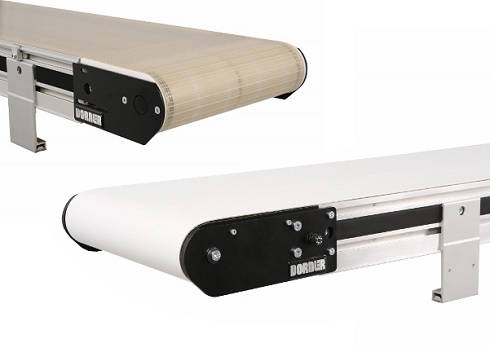 The 3200 Series modular and flat belt conveyors are designed to handle medium to heavy sized parts, while the 2200 Series Precision Move conveyor offers the latest advancements in timing belting and drive technology, and is ideal for applications that call for extremely accurate movement of product at specific times, distances and intervals. Dorner’s SmartFlex is a flexible table-top chain conveyor that’s engineered for the food, medical, life sciences, industrial automation and packaging industries. The Ultraclean Products Approval Laboratory certification is a leading national test center for contamination control engineering. Some of the testing and certification services include a variety of cleanroom equipment such as benches, cabinets, fume hoods, material handling systems, and vertical and horizontal flow cleanrooms.